Alfred Hollinshead Service Details - Whitby, Ontario | Barnes Memorial Funeral Home Ltd.
After a brief battle with cancer. Peacefully at his home in Brooklin Ont. 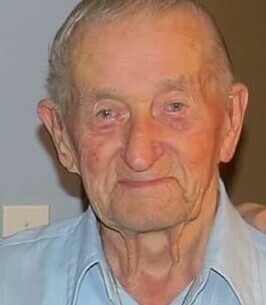 on Aug 27th 2018 at the age of 90. Parents Edward and Elizabeth had 9 children. Survived by 2 sister's Dorathy and Vera. Beloved husband of the late Helen (MçInally). Loved father to the late son Stan, daughters Darlene and Bonnie (Terry ). Sid was very proud and loved his grandchildren, Adam, Melissa, Robert, Michael, Krista, Scott and great granddaughter Ava. He enjoyed life, spending time with friends and family by the pool and working in his gardens. Sid was a dedicated employee of 35yrs at Canada Wire and Cable. He would still reminisce of his years working there. A private graveside service will be held at Groveside Cemetery Whibty Ont. on September 8th 2018 at 12:00 Noon. Followed by a celebration of life at his home. Special thanks to Dr Libby and Heather. All Staff of CE LHIN. In memory of Sid, memorial donations to a charity of your choice would be appreciated.